No, Braven's new BRV-BANK isn't another smart wearable device. It is, however, the world's first Bluetooth-enabled smart portable backup battery pack that's also designed to be an essential piece of gadgetry for use out in the great outdoors as well as for emergency preparedness using a number of safety features wrapped in a everything-proof enclosure. 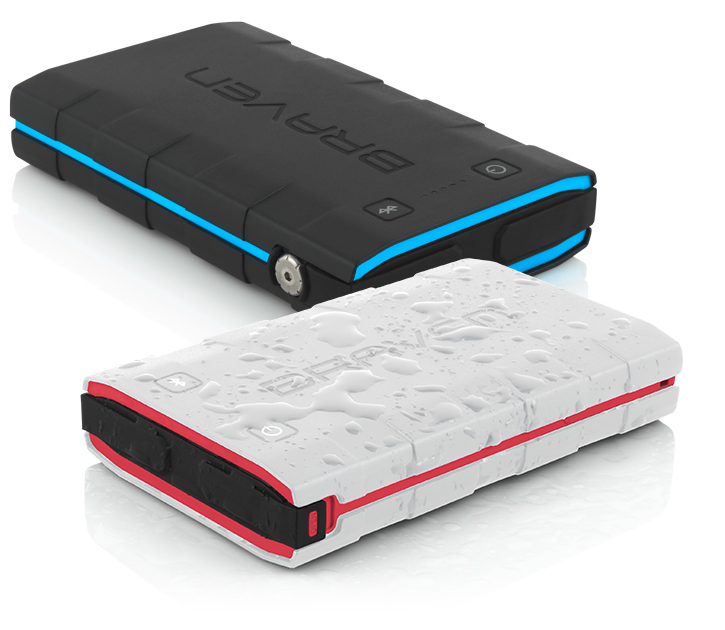 With a 6000mAh rechargeable battery encased inside a sealed silicone-clad exterior that's ultra-tough, impact and water-resistant, the BRV-BANK is capable of charging two devices simultaneously using its two flap-covered USB ports no matter the terrain or weather condition. There's a fast 2.4A USB charging port designed for large devices like tablets, and a 1A USB charging port which you can use to either charge a smartphone or power on the included USB flashlight attachment accessory. Braven’s BRV-BANK can be remotely controlled through its Remote Battery Monitor App, which offers users the ability to locate the BRV Battery Bank, monitor its power levels, individually turn on and off each port to conserve power, and activate its two additional features: Bear Mode and S.O.S. The Bear Mode activates your smartphone's motion sensor, sending signals to the bank to sound an alarm and activate the connected USB flashlight when your phone is moved. Turning on the S.O.S. mode activates the universal distress signal by sending a visual Morse code for "S.O.S." using the connected USB flashlight. The BRV-BANK comes with a variety of accessories, including a reinforced lanyard for hanging and easy carrying, a ruggedized micro-USB cable for worry-free charging under the harshest conditions, and a convenient USB flashlight. BRAVEN’s Remote Battery Monitor App can be downloaded on the App Store and on Google Play. The BRV-BANK's 6000mAh battery capacity is said to be capable to charging most smartphones up to 4 times. It's available now for $130 in white/red and in black/blue colors.